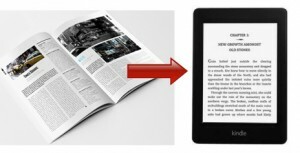 We at www.itglobalsolution.com provide customers with accurate quality conversion services from Magazine to Kindle feed. As we all know, Magazine is one of the most well established and renowned medium of in the publication business. A good collection of stories, articles, news with colorful images has been an integral part of the magazine since its launch. With the technology advancement, the Kindle users have been on the rise and this has resulted in venturing of the magazines and newspapers into ebook business. The newer version and advanced feature of the Kindle reader are helping the users in experiencing the magazine effect on the Kindle device. www.itglobalsolution.com provides an accurate and economic solution in the magazine to Kindle XML conversion. Our expertise and experience lies in preparing and tagging appropriate kindle feed in NITF or XHTML format. The Kindle feed must contain two types of files: manifest and article files. XML feeds must be well-formed and free of errors. No advertisements or links to third-party content. The video, audio, or flash content should NOT be present. There should be no web links in articles. Color images should be in the largest possible size and highest resolution. Content must match the Kindle QA reference. Expenses involved in the conversion process. Turnaround time required for the conversion to take place and send it back. On being paid by the client, we will initiate our Kindle conversion process. We follow a manual conversion procedure; hence we have more control over issues related to formatting of the text images, etc. Once the conversion is complete, our expert team will conduct a thorough quality check to make sure that the end result is an error-free document and a well prepared Kindle XML Feed document. We will give you a feed URL which you can submit it in your account and test it for any errors. If you are looking for a Magazine to Kindle XML feed conversion provider, please do contact us at Bob@ebookconversion.com or call Bob at Supremus Group on -LRB-515-RRB- 865-4591.